WW1 Reenactments Equipment : Great War Tommy WW1 Documents, Paperwork : A Soldiers Prayer leaflet & card. WW1. 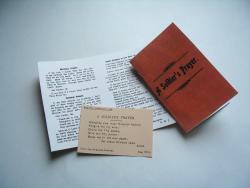 WW1 Reproductions and WW1 Reenactors Equipment / Kit - A Soldiers Prayer leaflet & card. WW1. A Soldier's Prayer leaflet & card. WW1. A soldier's prayer slip (three prayers) for the AB40 and a Soldier's Prayer card from the Chaplain General in 1914, "Slip this inside your cap".